Five Star creators Terence Hanley and Jordan Lowe were at the River City Comic Con in Marietta, Ohio, this past weekend, and both were interviewed by a reporter for a local paper, the Parkersburg News and Sentinel. Jordan, owner of Asylum Comics in Marietta, was the organizer of the event. Terence, creator of two cryptozoological and extraterrestrial coloring books and the comic book Lucky Girl, was one of about twenty vendors at the convention. It was a hot, humid day, but the vendors and the attendees gamely stuck it out for an enjoyable show. Jordan Lowe and Terence Hanley were both featured on the website of the Parkersburg News and Sentinel. You can read all about it in Natalee Seely's article, "River City Comic Con: First in the Area in 10 Years," here. Five Star creators Larry Blake and Terence Hanley will be at the River City Comic Convention in Marietta, Ohio, this Sunday, July 24, 2011, from 10 a.m. to 5 p.m. The convention will be held at the Junior Fair Building, Washington County Fairgrounds, 922 Front Street, in Marietta. Larry will have plenty of original artwork for sale, plus his regular comic books and other publications. 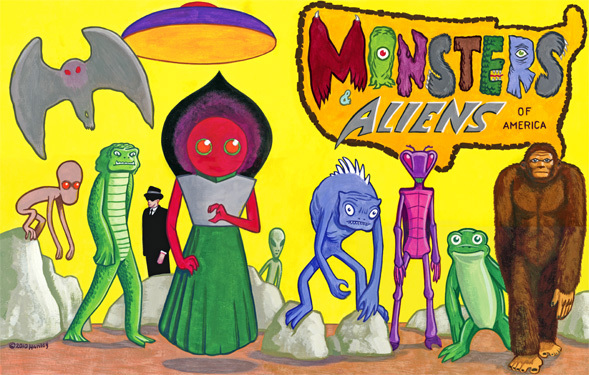 For sale at Terence's table: Mothman, Aliens, and Flying Saucers and Monsters and Aliens of America coloring books, Lucky Girl #1, and Mothman '66. Terence will also draw pictures for young and old. You'll find more information about the convention at its website, here. Writer Jordan Lowe is a relative newcomer in the indie comics game, but he’s already amassing a resume to be proud of and feels right at home with the gang at Five Star Comics. He opened the store Asylum Comics in his hometown of Marietta, Ohio, in 2005, which he has freely admitted to doing in order to meet fellow comic creators. His first such collaboration was with artist Michael K. Easton on the city-full-of-superheroes tale Paradox City and continues to this day on their web comic Short Pants Romance, about a famous former kid sidekick who’s pushing thirty. Jordan and Michael co-founded OVAL, the Ohio Valley Artists League, where writers and artists gather for collaboration, motivation, and the production of a yearly anthology of their work. 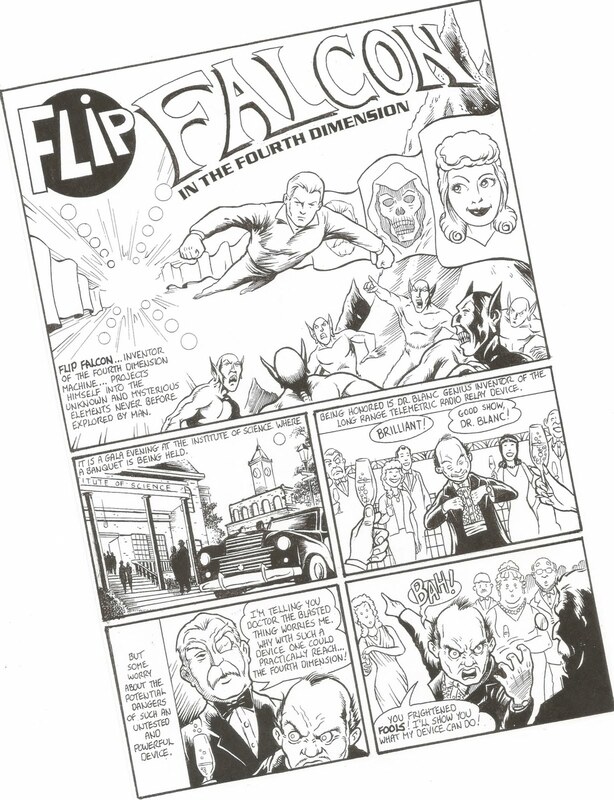 Jordan wrote the script for “Flip Falcon in the Fourth Dimension,” drawn by artist Gary Gibeaut for Five Star Comics #1, due out this summer. Jordan is also ready to begin posting the third volume of Short Pants Romance online and is producing an anthology of short, offbeat horror and fantasy stories with artist Z.D. Brooker called Strange Books and Paper. If that wasn’t enough to lose sleep over, he is also hosting the first annual River City Comic Con in Marietta, Ohio, on July 24, 2011. Five Star creators Larry Blake and Terence Hanley will be there, too. Five Star creator Terence Hanley will be at the Derby City Comic Con in Louisville, Kentucky, this weekend. This year is the first for Derby City and anticipation is high. The convention takes place on Saturday, July 16, 2011, from 10 a.m. to 5 p.m. at the Kentucky International Convention Center, 221 Fourth Street, Louisville, KY 40202. Terence will have his coloring books--Mothman, Aliens, and Flying Saucers and Monsters and Aliens of America--available, plus the first issue of Lucky Girl, Mothman '66 poster, and coloring pages of Orange Eyes, the Beast of 'Busco, and Louisville's own Pope Lick Monster. You can find out more by visiting the website of the Derby City Comic Con, here. Monsters and Aliens of America coloring book, available at the Derby City Comic Con, July 16, 2011, in Louisville, Kentucky. Gary Gibeaut has drawn comics since he was a kid. Now his artwork is in print--in comic books and coloring books, on t-shirts and stickers. Gary's main title is Guard Dawgs, the story of a supergroup that began shaping in his mind and on his drawing board many years ago. There are three issues of Guard Dawgs in print with more--and maybe even a web comic--on the way. Gary is also the creator of a Mothman coloring book, a "Mothman Rocks!" sticker, and Mothman t-shirt designs sold every year at the Mothman Festival in Gary's hometown of Point Pleasant, West Virginia. Best of all for fans of Golden Age superheroes, Gary has illustrated Jordan Lowe's "Flip Falcon in the Fourth Dimension" for Five Star Comics. In Jordan and Gary's story, Flip Falcon must travel into the fourth dimension to rescue a group of scientists from a circle of demons and their newly crowned king, the evil Doctor Blanc. Look for "Flip Falcon in the Fourth Dimension" in Five Star Comics #1, due out in the summer of 2011!